Fernando Hierro’s Spain totally dominated the match at Luzhniki Stadium in Moscow, hogging 74% of possession, but created few clear-cut chances and buckled under pressure when it mattered most. 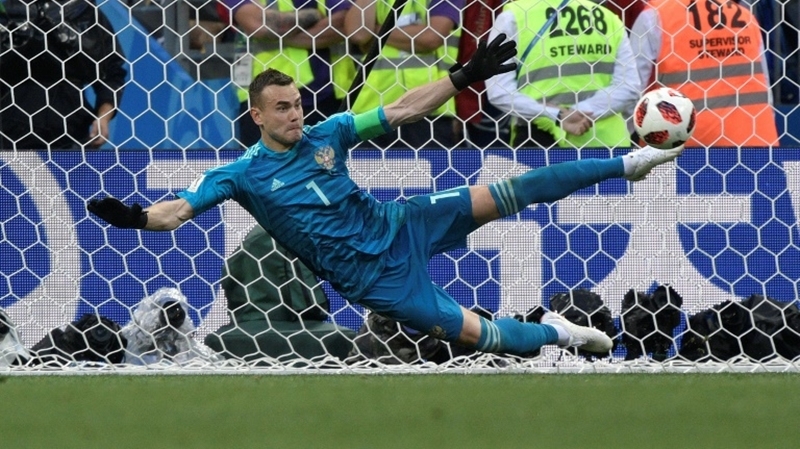 Veteran goalkeeper Akinfeev saved penalties from Koke and Iago Aspas as Russia won the shoot-out 4-3, reaching the last eight for the first time since 1970, when they played as the Soviet Union. Five spot-kicks were saved during the nail-biting shoot-out, two by Schmeichel and three by Croatia goalkeeper Danijel Subasic. Russia are the lowest-ranked nation in the tournament – a lowly 70th in the world – and were not expected to progress beyond the first round but they now find themselves in the last eight. Spain shipped five goals in their three group matches and there were major questions over the form of goalkeeper David de Gea coming into the knockout phase. “We had opportunities to win this match but we ended up in a penalty shoot-out which is basically a lottery, and we weren’t lucky,” he said. An impromptu mass party took place in the historic centre of Moscow late in the evening. Cars blared their horns as police and guards looked on. “It’s great. Unbelievable. We are champions. We believe we will now be in the final with Brazil,” said Anna Glazkova, 27, a human relations manager. “I’m feeling perfect,” said Ivan Lisin, 28, a Spartak Moscow fan, who works in digital marketing. He had the Russian flag painted on his cheek. Yesterday’s shock win for Russia follows the exits of Cristiano Ronaldo and Lionel Messi the previous day and means three potential contenders – Portugal, Argentina and Spain – have been dumped out in just 24 hours. Ronaldo will be 37 by the time the next World Cup is played in Qatar, but he would not be drawn on whether he planned to extend his international career after Portugal lost 2-1 to Uruguay on Saturday (June 30). Messi, 31, was unable to find the net as France beat Argentina 4-3.